The committee of 3rd IC-ISLAB has reviewed all submitted abstracts. We would announce the enlisted abstracts. Please download the attachment file. The official language for oral presentation is in English. The oral presentation, slide, and handouts, should also be written in English. But for several circumstances, please inform us if you intended to give oral presentation in Bahasa Indonesia. 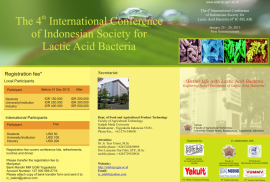 The Indonesian Society for Lactic Acid Bacteria (ISLAB) was established on March 12, 2003 after the establishment of Asian Federation of Society for Lactic Acid Bacteria (AFSLAB) in November 2002 in Tokyo, Japan. 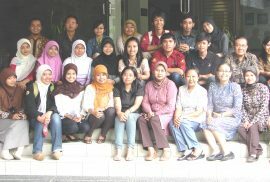 Currently, approximately 200 Indonesia scientists are registered as the member of ISLAB and have been actively conducting many researches in this area. 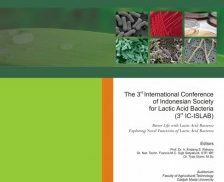 In order to disseminate the research activity and to strengthen the network among researcher as well as industrial partners, ISLAB would like to organize the 3rd International Conference of Indonesian Conference on Lactic Acid Bacteria (IC-ISLAB).